HomePoliticsDo You Regret Voting For Donald Trump? You’re Not The Only One. Do You Regret Voting For Donald Trump? You’re Not The Only One. Many people are starting to regret voting for Donald Trump. This shouldn’t come as a surprise to anyone considering President Trump’s record-breaking unpopularity. In this article, I’ll explain why so many voters are regretting voting for Donald Trump and show you where to go if you’re one of those people who are unsatisfied with your vote last November. So, You Regret Voting For Donald Trump? So Do These People. 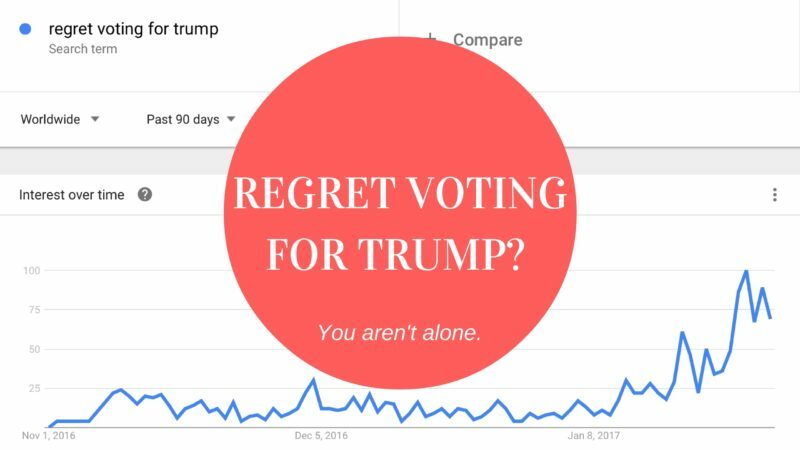 Reddit’s latest popular subreddit, known as r/Trumpgret, centers around posts of people who regret voting for Donald Trump. This new subreddit is already approaching 20,000 subscribers and was the #1 trending subreddit on January 31, 2017. Voters all across the country are starting to feel the pain of Trump’s Presidency. The state of Iowa is already feeling buyer’s remorse, where Trump’s approval rating is floundering. This is a bad early sign for Trump in 2020, where Iowa will likely be a crucial swing state. Why Do So Many Regret Voting For Trump? It’s not difficult to explain why many voters regret voting for Donald Trump. Beyond historic unpopularity, voter regret starts with Trump’s “Muslim ban” which sparked protests across the country. Only one third of Americans believe the policy will make America safer, while the issue as a whole remains a wedge that deeply divides America. The Muslim ban protests were not the only protests in defiance of Trump. After his inauguration, millions across the globe marched in protest of his Presidency. Many are still outraged by his lewd comments towards women and his eagerness to repeal Obamacare, which would leave millions without health insurance. In a highly contentious election with two highly unpopular candidates, it’s not surprise that so many people are unhappy with the decision they made. Ultimately, it’s ok if you regret voting for Donald Trump (or Hillary Clinton, for that matter) because there are more elections in 2017, 2018, and 2020 where you can right your wrongs.